I decided to make a cake for a local cake contest. It was in October for a Halloween festival. 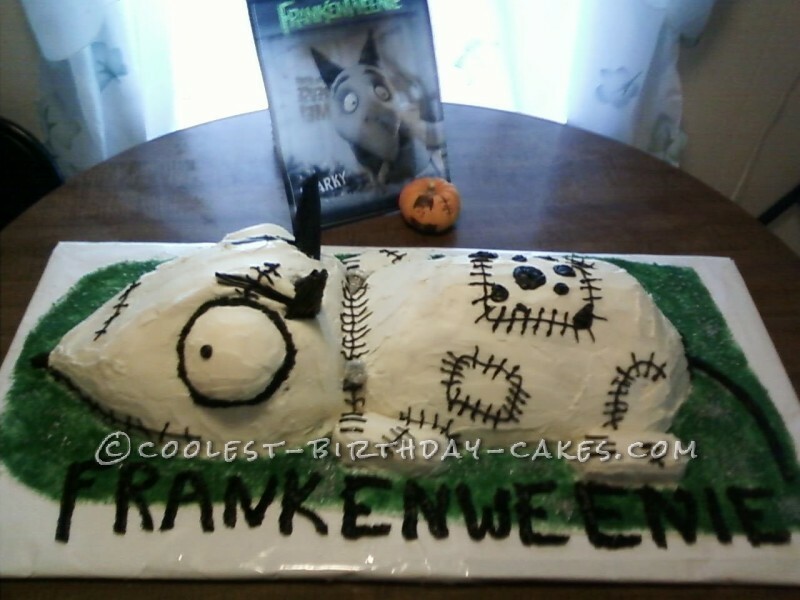 My kids loved the Frankenweenie movie, so we decided to make a Frankenweenie cake. I always look online for cake ideas, but I found very little for this cake. So I just looked up images of the dog from the movie. I got out paper and a pencil and started drawing it out with the plans. I just baked lots of round caked and put them together and shaped them to make his body. I used Twinkies for the legs and Hostess snowballs for the eyes, after I scooped out some cake to hold them in. I cut ice cream sugar cones in half and shortened them for the ears. I covered them in black frosting and black lace licorice. I tied black lace licorice together and baked it on low for 15 minutes, took the ties off and let it cool to harden. His bolts are made of pretzel rods with a candy stuck to the ends I frosted them then rolled them in silver sprinkles. He was the favorite of all the kids at the festival.